Explore, experience, together! Available for the first time in the U.S, the Hamax Caress Child Bike Seat exemplifies Scandinavian design and safety standards to protect the most precious cargo you will ever have. A rear-position seat, the Caress is available in both FRAME MOUNT and RACK MOUNT options - be sure to review more product information below to determine which is best for you. The Hamax Caress is set apart by its sleek, modern design that accommodates the needs of a growing family. The seat back, foot rests, foot straps and 3-pt harness offer easy adjustability for children from 9 mo to 48.5 lb. Every adjustable feature is designed to enable quick, single-handed adjustments so that you can always leave one hand on the bike to ensure stability. Anti-theft locks with keys, a reflective back and optional spoke guard attachments provide added security and peace of mind. Unprecedented comfort features include integrated, changeable padding, helmet cutout and reclining seat for sleep positions from 0-20°. 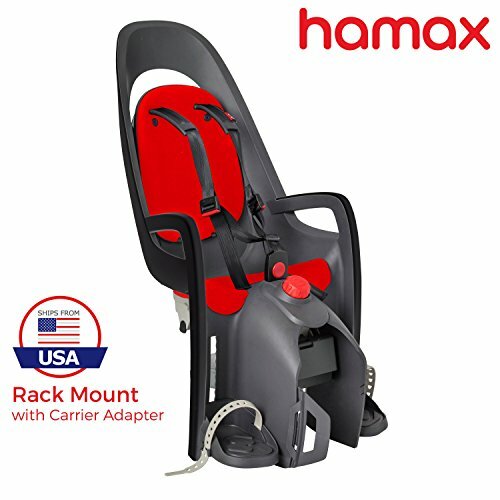 Hamax Caress Child Bike Seats are easy to assemble (tools included), and are safety certified (TUV/GS mark for EN14344, ASTM F-1625), phthalate-free and manufactured in accordance with all chemical requirements (CPSA/CPSIA, ASTM, EN and REACH). Hamax is one of the largest and most recognized names in child bike seats in Europe, and the Caress model was recently awarded "Best in Test!" by a Dutch consumer group with participants lauding its comfort, generous suspension, adjustable features and back reflector. *48.5 lb weight limit based on mandatory European standards. 40 lb weight limit based on optional US standards. Box labeled in accordance with optional US standards. Shipped from WA. Typical delivery in 5-7 business days.